Glue is available in hot melt, solid animal, or liquid forms. 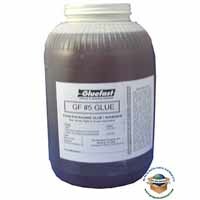 The liquid glues we offer are used in the label pasters and gluers. Apply adhesive on the back of paper and other substrate that can then be applied to a second substrate. Applications include POS displays, labeling with pre-printed labels, making invitations or business cards, and many more. Solid form glues include pillow or sticks for Hot Melt applications. 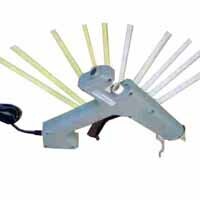 Pillows are placed in automated equipment and sticks are used in hand held glue guns. Hot melt adhesives are used in applications involving light assembly where items need to stick quick. 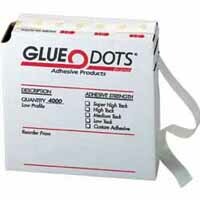 Glue dots or spots are a solid yet sticky adhesive. These can be used to 'tack' posters to walls, credit cards to forms, or other items with different degrees of stickiness. We also carry a type of adhesive used to coat prints. Gluefast offers Craquelure Faux Finishes to make custom prints look like paintings by brushing or rolling on. 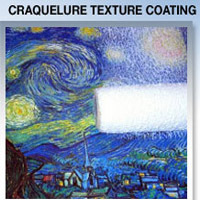 Coating to add a paint like finish to printed pictures. Liquid cold glue for label gluers. Glue dots for quick stick.